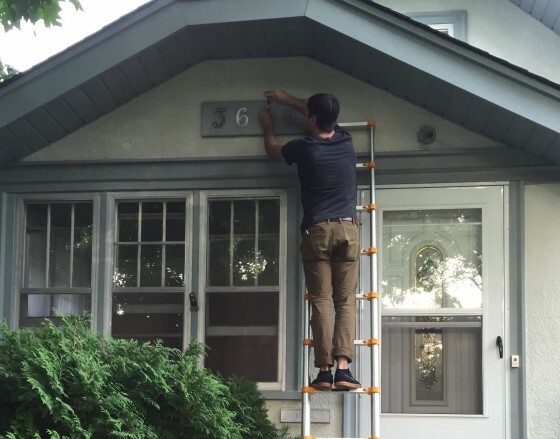 7 Home Projects That Require a Telescoping Ladder- Exterior Edition. Is it just us or is there something about the early days of fall that really makes you want to get the home ready for winter? September is the perfect time to prepare yourself and your home for some serious nesting. Last fall we showed you Seven DIY Projects That Require a Telescoping Ladder, this time around we want to show you some projects that will have you working outdoors. Before the dark days of winter set in, make sure that your exterior light bulbs have been replaced. Icy sidewalks and snowy roofs will make this job a great deal trickier and more dangerous if you wait. It’s no one’s dream job but someone needs to do it. Those gutters which we love for their ability to redirect water from the house are also excellent places for unwanted foliage and debris to collect. Clean gutters assure a roof that is free of potential ice dams and rust- not to mention critters! Fall is a great time to organize your garage. Utilize your space to the fullest by storing things like canoes, bikes and lumbar in your garage’s rafters. Exterior paint will eventually chip away. In order to prolong the beauty of your home, take in a sample of your paint (roughly the size of a quarter) to your local hardware store where a paint expert can match your color and mix you a new pint or gallon. All you need now is a smaller container to pour your paint into, a steady hand, a two-inch paint brush and an Xtend+Climb ladder! Tree trimming is important for aesthetic reasons and also to encourage the growth of strong, healthy trees. Cut back branches that have gone awry or that have died. You’ll be improving the look of your yard while making it safer. Are your windows due for a good clean? Cease the day and get those windows sparkling while you can! As soon as the freeze sets in you’ll be glad you have a clear view of the great outdoors. Your inner child will thank you! Follow this DIY to see how!